World Environment Day, on June 5, is a time for us to think about the planet, what we’re doing to it, and what more we could be doing to protect it. In 2015, the theme is Seven Billion Dreams. One Planet. Consume with Care. We all have dreams for our future, but whether some of them will happen depends a lot on us and how we take care of the world we live in. We can make choices that are better for nature, and when we do so, we quickly discover those choices are also better for us in terms of our health and our happiness. 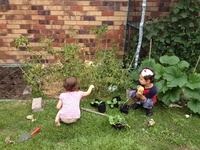 This year, World Environment Day kicks off a long weekend in most parts of Australia, making it a perfect time to get together as a family for some fun activities that celebrate the importance of our environment. Here are 10 family activities to try this weekend to celebrate World Environment Day. Whether it’s a trip to the beach, a walk in the bush, wandering mountain trails or visiting one of the local nature reserves, simply getting out and connecting with the environment – breathing in that fresh air – is a wonderful way to spend some time together. You can make up games to play while you’re at it. Use your detective skills to try to track down bugs and insects or identify plants and trees. Or perhaps make up a scavenger hunt – a gum nut, a pine cone, flat rock, shiny pebble, stick…anything you want…and give everyone 20 minutes to see how many they can find. Grab some gloves and a bag, and take a walk around your neighbourhood or down to your favourite park, creek or beach, picking up any rubbish you see as you wander along. Pop it all in a bin when you’re finished (or take it back home if there’s no bin nearby) and then relax knowing you’ve made a contribution to taking care of the environment for yourself, and others. Native trees are far more suited to the harsh extremes of Australia’s climate. They tend to need far less water than non-native trees, and also provide important food and shelter for native birds, insects and animals. You can water them from your rainwater tank to make the garden totally sustainable. Pick a tree that is native to your area for the best result. Some councils even offer a free native tree program, so see if you might be eligible. Find a good location in your garden and be sure to water it in well, and apply mulch to give it the best start. Many communities hold festivals and events to celebrate World Environment Day. These can include tree planting activities, home gardening workshops, classes in making art from recycled materials and whole day fairs. See if something’s happening in your area and go get involved. Or resolve to go spend a day at a community garden, or visit one of the local farmers markets to spend time getting to know other like-minded people doing their bit for the environment. Did you know that one-third of all food produced globally each year is wasted? Food production is responsible for more than 70 per cent of freshwater consumption, 80 per cent of deforestation and is the largest single cause of species and biodiversity loss… All good reasons to use everything we buy. Why not go through the fridge and the cupboards, pull out those sad and soggy looking vegies and items nearing expiry and see what you can make with them. Throw it all together in a slow cooker for a warming meal for these cool nights; make a soup; or roast things together for a yummy mash. Get inventive and have some fun together…and find ways to make use of everything rather than tossing it in the bin. There’s nothing quite like going out into your own garden and harvesting the food for your meal. So many vegies are easy to grow – even in pots if you don’t have a garden – and now is a great time to be preparing the soil and planting seeds for bumper spring-time crops. For some quick colour and food you can harvest now, plant out some pots of herbs and spices. And think about making your own compost. Any vegies you couldn’t use in your big cook-up can find a new life as food for the vegie patch. Gather leaves from the ground and make a collection by gluing them into a book and writing their names underneath. Or turn the leaves into art using other bits and pieces found in nature, along with pencils or paints, to form pictures on paper, or perhaps a diorama in an old shoebox. If you’re out at the beach, why not get the kids involved in making some installation art pieces. Collect driftwood, shells, pebbles, seaweed – anything lying on the sand – and see what they can create from it. If you’re out camping, or in the bush or rainforest, search around for twigs, leaves, rocks and other bits and pieces to make your masterpiece. Let the kids make a small pond with a water feature and watch them play for days to come. Getting rid of your excess can actually be a lot of fun, and really rewarding, when you pull together as a family to clear out those overflowing cupboards. Work together to figure out what you still need and want, and what no longer has a place in your life. Then the real fun begins – finding new homes. Remember – Reduce, Reuse, Recycle! Some items can be donated to charities and will be gratefully received by others finding it difficult to make ends meet. Buy, Swap and Sell websites and Facebook pages also provide a way to move on your unwanted goods – and you’ll get to see the joy in the people’s faces when you give it to them. For those special items, try advertising them for sale. Those dollars could help buy seedlings and plants for your garden. Get everyone involved in making new choices about what you consume. Do you really need what you’re planning to buy? Is it going to be wasted? Is it a quality product? Give everyone a task for reading labels – is it certified sustainable? Organic? Locally made? It might make the shopping trip a little longer at first, but you’ll all be engaged in discussing what you’re buying and why, and making the best possible choices for yourselves and the environment. And remember to take your own bags and say no to plastic. As a family, have a look at all the things you do well to save water, reduce energy usage and prevent waste. Then all come up with some ideas on what more you could do and vote on three things to introduce this weekend. Make it fun. Get the kids involved in drawing pictures of your new goals, or writing up lists as reminders of your new habits. Assign yourselves a reward for your first successful week, then your first successful month of following your new habits. Celebrate what you’re doing as a family, and congratulate yourselves for taking action to protect the world we live in. These activity suggestions have been prepared for you by the fun-loving team at Families Magazine Brisbane. Families Magazine Brisbane is an A4 glossy magazine, a brilliant website, a social media network and its own youtube channel for families in Brisbane. It provides an up-to-date list of What’s On & things to do with kids and families in Brisbane today, tomorrow, next week and next month.